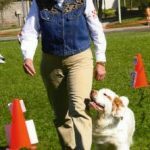 Dog Obedience and Agility rings are filled with Border Collies, Australian Shepherds, Corgis, Parson Russell Terriers, Labs and Golden Retrievers. But what about Clumber Spaniels, Pugs, Bulldogs, Norwegian Elkhounds and Great Danes? 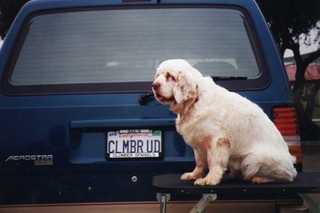 Gail Budde trained the first Clumber Spaniel to get a Utility Dog leg, "Breaker". 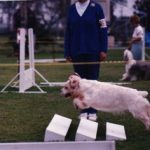 Breakaway N or M, CDX, RE, MJP, MXP, TDI, CGCA, TT, NFP continued to compete in agility until the age of 10, and obedience until 11 years. 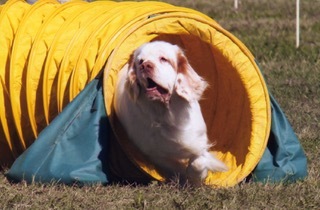 Clumber Spaniels are long and low, heavy-bodied, intelligent hunting dogs. Great Danes and giant breeds don't turn on a dime. Pugs and Bulldogs are not know for nimble leaps in the air. 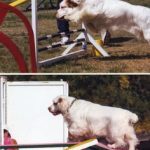 Just because a breed has a different body structure doesn't mean that they can't succeed in obedience or agility. 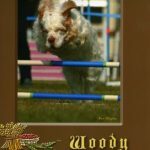 They may not prance at your side with head cranked up or dance through the weave poles, but each breed can do the job with their own style. 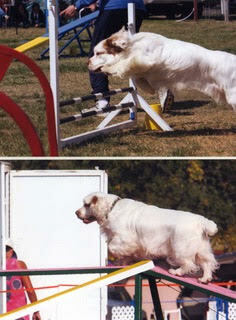 First, don't compare and try to do what other breeds do. Your dog is unique in it's structure. 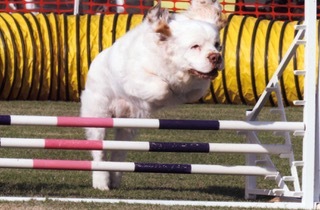 Long and low breeds have straight sit challenges. Consider the geometry involved. 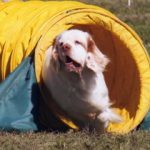 Clumber Spaniels are not fast out of the gate, and teaching a fast recall can be a challenge. Think change of speed vs greyhound speed and reward quick or energetic starts. 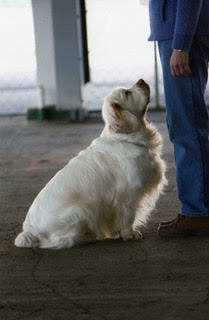 Not every dog will chase a ball for hours or drill repetitive exercises. Chase a ball 2 times? Be creative and be ready to constantly vary the rewards. Have confidence in yourself and your dog. Be prepared for the two of you, as a team, to create your own unique style. Remember...linebackers, gymnasts and sprinters do not move the same. They condition and perfect the body structure given to them. 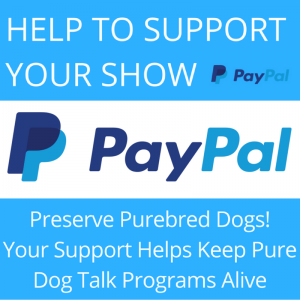 Breeds have temperament traits as well. Golden Retrievers are "want-to-do" dogs, and Clumber Spaniels are intelligent thinkers that require a meaningful reward for them. 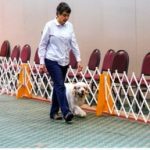 Tailor your training to your breed, your dog. Again, don't compare. Are short, single exercise sessions best? One, done then fun? Or a series of 5 different exercises in a row? 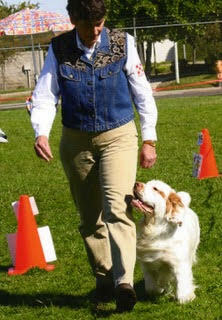 Gail Budde trains Clumber Spaniels and Golden Retrievers. 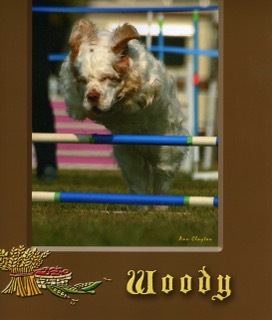 All of her Clumber Spaniels are Therapy Dogs or in the process of becoming one. 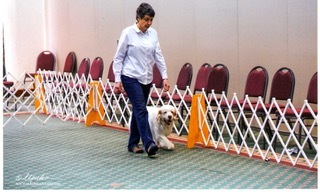 Gail competes and enjoys most dog venues, including barn hunt. 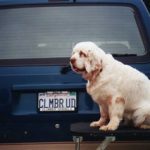 No disrespect to Gail and her accomplishments, but She did not earn the first UD on a Clumber Spaniel. Check your records! Judy, Gail didn’t say she earned the first UD (was that you?) but the first leg toward it. I do admire everyone’s dedication in training and obtaining any sort of performance title. Clumbers are wonderful, but EASY they’re not! 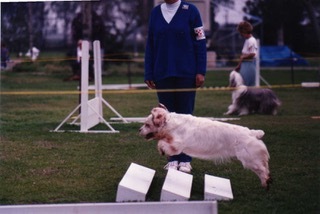 ACTUALLY, my Abby was the first Clumber ever to earn a UD leg…she did not attain the UD as she was retired at a young age. Gail (as I just listened) said that Breaker is the first MALE Clumber to earn a UD leg. Bets Young’s Lady Di was the first Clumber UD. As stated, Breaker was the first Clumber to earn a Utility *leg*. He does not have a UD. Still a wonderful accomplishment! Gail is the most patient trainer I have ever met. And so dedicated to her dogs and their training. She is always kind and gentle when working with them. She is my HERO!!! You go Gail. I’m confused, Gin earned her UD many years before Breaker. Unless Breaker was the first male Clumber to earn a UD leg? Nice write up on a dear friend, I worked with Gail getting Breaker started in tracking, unfortunately the dry weather and his age were a hindrance. I would say 15 or less of us are seriously working and competing in obedience, rally, and agility. Gail has a long history of training clumbers and has been an inspiration to many. Janice Scott is working Hatfield. A lovely, happy talented dog. This was an excellent interview with a very impressive trainer. Thanks for choosing for DogTalk.